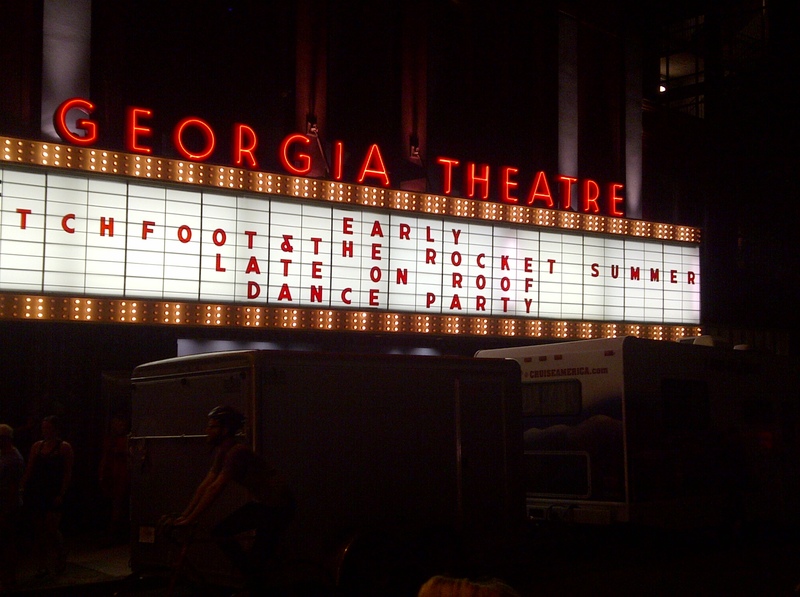 Touring together, The Rocket Summer and Switchfoot made a stop off the beaten path, coming to Athens, Georgia, as part of their pre-summer tour. In the historic Georgia Theatre, pictured below, a full crowd was treated to about eight songs by The Rocket Summer who was the opening band for the show. For those of you who are not familiar with The Rocket Summer, Bryce Avary is the song writer, producer, and lead singer… He’s on the keyboards, guitar, bass, and drums too. He’s a multi-talented musician who pays every piece of the band. Of course, this isn’t possible when performing live so I was unsure how good they would be in concert, but his touring bandmates filled in admirably, and there wasn’t a discernible difference from his recording sessions, when he plays every piece. Though I went to see The Rocket Summer, most were there for Switchfoot. The song they are best known for, “Meant To Live,” was their second to last song and it was even better than expected. It was really brought to life in concert. Aside from that though, a lot of the songs I didn’t know and were just decent. One song did stand out though. “The War Inside,” a track of their newest album that I hadn’t heard before was great live. I recommend checking it out. The lyrics are pretty well done on it. “This Is Your Life” was another really strong song that the crowd got very into. They played it early and closed with “Dare You To Move.” Overall, Switchfoot was solid. I was never a big fan of theirs, but I gained some respect for them after seeing them in person. One last note, Bryce Avary said he had played in Athens once before. It was eight years ago at 40 Watt when he opened for Something Corporate. That would be a show I’d pay to see. Unfortunately, Something Corporate is now defunct, though seeing The Rocket Summer open for Jack’s Mannequin (Something Corporate’s successor in a sense) seems viable and nearly as fun. Anyway, look out for my review of Life Will Write The Words by The Rocket Summer coming in June. You’re a great writer, Ryan, and I’ve even seen some improvements to your style in the time I have been reading your posts. However, your readers would have been further entertained had you given the facts about the Graduation Party that you attended after the Rocket Summer / Switchfoot concert on that glorious night. That was hands down one of the top 5 most delightful nights in Athens for you, me, and all parties involved. That was a great night. I won the award for “Most Likely To Get Brushed Aside By Dr. Wurst.” He humorously ignored my questions in class all semester. Pingback: The Rocket Summer BR - Sua principal fonte sobre TRS no Brasil!